This is a bit different from the other books I have written myself. 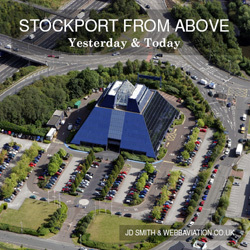 This one is written by local Author JD Smith and contains both old and new aerial photographs of the town spanning the period from 1926 to the most recent images taken in 2007. The historical images are from the archives of the Stockport Heritage Library and the new images I have taken myself between 2005 and 2007. The new images involve the largest oblique aerial photographic survey in the towns history. The book is hardback with 200 pages. Click here to see the other books in the series.